The sun rises over Halawa Valley, Molokai. Greg Solatorio blows the pu, or conch shell. 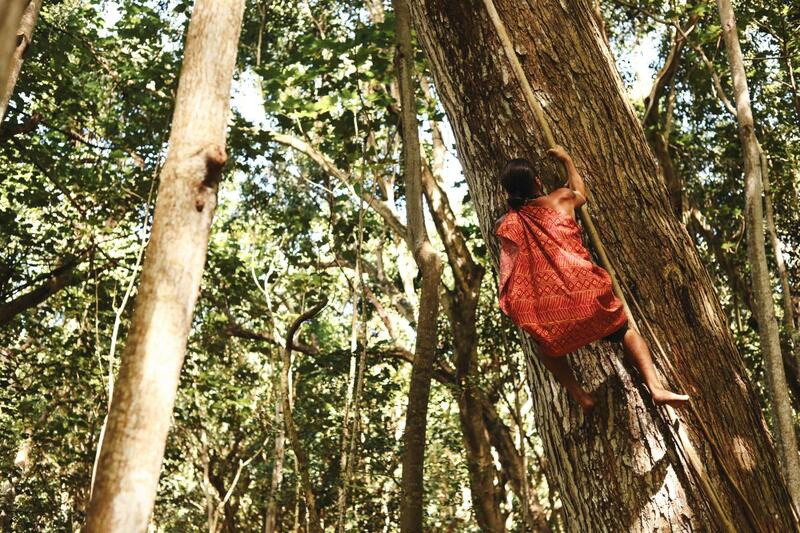 At the other end of the lush valley, Greg’s father, Anakala Pilipo Solatorio, blows his pu back. There is no cell phone connection here. This is how father and son communicate over distances. The conch shell echoes across this beautiful, verdant valley. This could be today or it could 200 years ago. Greg is a cultural practitioner who lives off the land in Molokai. This island is truly unique in Hawaii because it has no fancy resorts, restaurants and golf courses. It is for the most part, frozen in time. 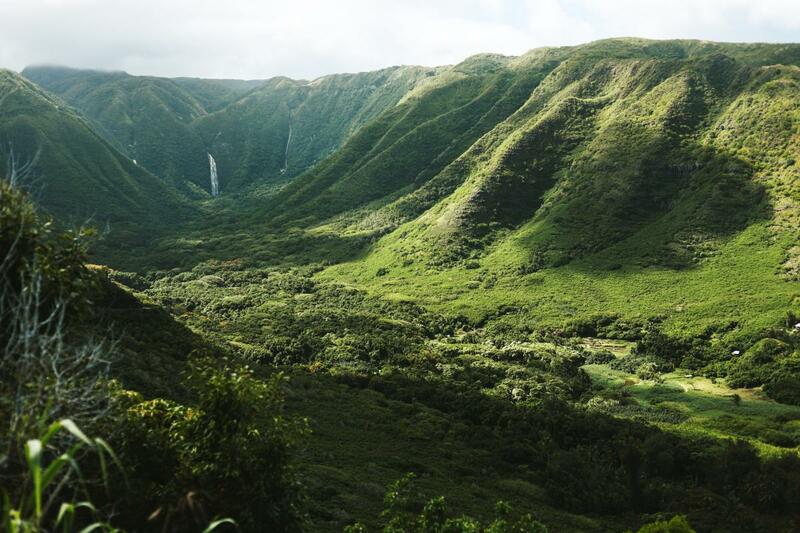 And no other place in Molokai exemplifies that more than Halawa Valley. The Solatorios are the last original family left in the valley. Greg’s father was the last elder, born and raised here. Their lineage connects them back to the first Hawaiian settlers on Molokai. Today, through the Hawaiian Homes Commission Act, this entire valley — from the peaks to the ocean — still belongs to the Solatorios. Halawa means “sufficient breath” or “sufficient life.” Here, the nearest store to get supplies is 29 miles away on a one-lane, windy road. In Halawa Valley, if you don’t catch your own food, you don't eat. That’s how it goes. Luckily, this valley is rich with bountiful fruit, fish and vegetation. It supported a village for more than a thousand years and it supports the Solatorios today. Recently, the responsibility of carrying on his family’s traditions and culture has been passed on to Greg. And there’s no other place he’d rather be. You lived away from Molokai and traveled the world. What brought you back? This is just something I always wanted to do, this is my passion. And one of my biggest role models is my father. He is my hero. He is a cultural practitioner, a kumu, a teacher, to many people. And the example that I saw him set, made me want to be what I am now. What does it feel like to live off the land? Well, I don't know if you’ve ever grown your own garden, or harvested your own deer, or caught your own fish, but the satisfaction you get from knowing the hard work that you put into these things, to reap the benefit of these things – and to know that I'm taking care of my family, feeding my brother, feeding my sister, feeding myself – is incredible. You actually get a peace in yourself, where you actually feel connected, and you start to feel whole. You operate Halawa Valley Falls Cultural Hike. Why is it important to share your way of life? Our culture, our family, our traditions, and our ways here in this valley – this is my expertise. I was always taught from my elders, especially my father, that culture is not secret, it is sacred. And that is what a lot of us need to understand, especially us cultural practitioners, culture needs to be shared. The minute we don't share culture, that's the minute our culture dies. How do you practice sustainability in Molokai? The way I was taught to practice it, the way with the people in Halawa Valley did it, is we work with mother nature. We believe there's a spiritual and a physical connection in everything around us. And once we find that spiritual and physical connection within those things, we start to understand, and we see things for more than what they really are. We don't take from mother nature. Because it is not ours to take. We ask and we borrow. We stay pure, we use the gifts that she gives us. It belongs to her, not us. What kind of sacrifices do you make to live this lifestyle? It's not an easy life. I spend a lot of time away from my family and kids but at the same time, they do come here and spend a lot of time with me. My kids can do everything that I do today. Not too many 13 year olds can go up into the mountain and go harvest a deer and bring it home to feed their family. And they know the modern life enough, where if times have to change and you have to live in the city, they'll be able to survive there. But no matter which way they survive, the culture will still be alive. Why is it important for culture to be taught by those who practice it? We say, "Nana i ke kumu," we go to the source. And without these sources – the people within these places who keep these stories alive – everything is gone. But when you have people that were born and raised in that place, seeing what the place used to look like, seeing what the elders used to do, and they hand it down to the next generation and teach them the exact things over and over again, now the story lives on forever. An epic storm tests a fifth-generation taro farmer’s legacy of sustaining the community. A teacher dedicates her life to take on the duty of bringing hula—the life of Hawaiian culture—from prohibited to celebrated. A chef gives up culinary fame to come home, and reinvents a humble plantation-era dessert with world-class technique and local ingredients. A kumu hula teaches how to respect the mana (power) of her Native Hawaiian stronghold. A spearfisherman and chef exemplifies taking only what you need, defending the ocean’s bounty and representing local farmers and fishermen in his cuisine. An ocean voyager leaves the safety of land to find her connection with her ancestors, and ultimately, herself. A trailblazing big-wave surfer empowers women to overcome the gnarliest challenges through surf therapy, just like she did. A cultural practitioner sacrifices everything to carry on his ancestors’ way of life, even as the modern world encroaches. A cultural practitioner bridges both worlds so that luxury and ease can coexist with the grit and authenticity that shaped her native land. 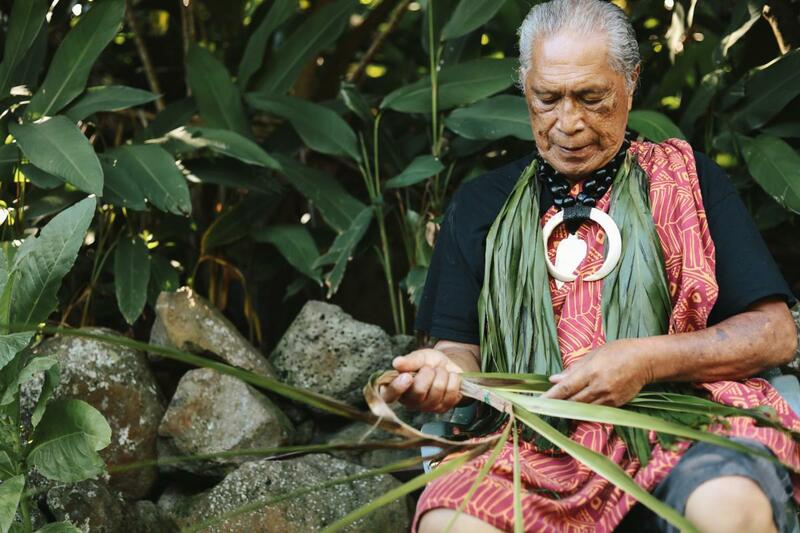 A young Hawaiian leaves home to further his education and returns with the ability to use chemistry as a platform to share ancestral wisdom with the modern world. Battling stereotype and cliche, a hula luminary expresses the meaning and power of hula from her Native Hawaiian perspective. Two Hilo natives buck industry convention to create a more holistic, sustainable farm-to-table experience that can only be created here. An ex-bartender works with Hawaiian researchers and local farmers to return glory to noble cane with craft and mixology, redefining the Mai Tai as a worthy cocktail. A misled youth returns in his later years to the source of familial wisdom to become a shaper of ancient alaia surfboards. A Native Hawaiian tattooist bestows ancient, hand-tapped kakau upon worthy recipients willing to endure a rite of passage. Please note: We apologize for any inconvenience, but our preferred business listings below are in English only.